Celebrating 30 years since Julius Dr. J Erving led the Philadelphia 76ers to the NBA championship, NBA TV Originals presents the new documentary, The Doctor, looking back at the life and career of one of game's greatest players. Through rare footage and original interviews, The Doctor shows how Erving reinvented basketball while playing in the American Basketball Association and how he later brought his above- the-rim artistry to the NBA. Sensational and well done documentary on one of the greatest players in ABA/NBA history. 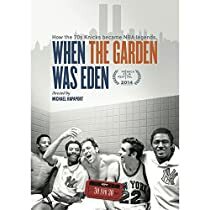 It is a classic DVD that defines how Erving was the key that forced the merger of the two leagues, the coming together of two rivals that saved them both and catapulted pro basketball into the powerhouse it is today. Without him pro basketball would be only a shadow of what it has become not only in the US, but globally. This film contains lots of seldom seen clips of Dr. J at his high-flying best, in the NBA and NBA as well as in the famed Rucker Summer league. Watch him do things Michael Jordan tried to replicate. Many of the highlights are astounding. His legacy, not only his greatness as a player, but as an ambassador for the game of basketball, is cemented in this film. It is one every true basketball fan should have iin his library. Maybe I'm giving this such high marks because I've always been fond of the Doctor. I grew up an ABA fan, and in the last years of the league, he WAS the ABA. He was the last great word-of-mouth athlete who arrived in the NBA mysteriously, the vast audience not knowing who he was. It's hard to find videotape footage of the ABA, so I enjoy what I can get. Doctor J is my all time favorite athlete. When he was with the Sixers I would watch them play anybody on TV, just to see what Julius Erving would come up with. Fantastic DVD documenting the career of The Legendary Julius Erving-DR J. I recommend this to anyone who marveled at his style and talent. Also any younger NBA fans who've heard the legends and have only seen today's players will appreciate it.